George Shuler was my brother. His life is an example of what can happen to those in the coverage gap, who are ineligible for Medicaid and make too little to qualify for the tax breaks offered under the Affordable Care Act. His death was an unnecessary tragedy. He was born in 1956 in Columbia, SC, the son of an SCDOT engineer and a nurse, George was a skinny, red-headed boy. A gifted student throughout school, he majored in music at USC, with the clarinet as his primary instrument, flute secondary. He played both classical and jazz music, and he was offered a seat in the Columbia Philharmonic before the age of twenty. In 2008-2009, at the height of the Great Recession, he was unemployed. To make ends meet, we sold some jointly owned family farmland and he was able to live on the proceeds for a while. Eventually, these funds ran out. At this point, in his early 50’s, he could no longer afford his Blue Cross Blue Shield personal insurance policy and despite having carried the policy for decades, he became uninsured for the first time. It was during this time, in August of 2010, while he was uninsured, that he was diagnosed with throat cancer. He called me in late August to tell me of his diagnosis. He’d suffered from a persistent sore throat all summer, but he didn’t go to the emergency room for a sore throat and he certainly did not have the money for a private doctor. At first, he didn’t think the problem was serious, but when he noticed substantial swelling in his throat, he finally went to the ER, where he received the diagnosis. I took him for a biopsy in early September. The surgeon came out and told me that the tumor was inoperable however, radiation and chemotherapy were possible treatment options. He was referred to South Carolina Oncology Associates, the largest private cancer treatment facility in the area. There we were told that there was no financial assistance available for him. Despite being unemployed, he was ineligible for Medicaid. We learned quickly that private oncology centers, where many patients receive radiation and chemotherapy on an outpatient basis, do not treat patients unless they have private insurance or are covered by Medicaid. He was referred back to Richland Hospital, because only major hospitals handle cases like his without insurance. Without the recommended chemotherapy and radiation treatment, his tumor was growing rapidly, so he was admitted and placed on the oncology floor at Richland Hospital, because in-home care was not feasible with his rapidly worsening condition. He required care around the clock, following a tracheotomy and the insertion of a feeding tube. At this point, we learned that the cancer had also spread to his lungs. His oncologist told us that a very difficult radiation and chemotherapy regimen might shrink the tumor and give him a little more time, but because of the type of his cancer, this was a death sentence. My brother remembered our mother’s thoughts on this, shaped by her decades as a nurse. She told us that she had seen too many sacrifice what little was left of their lives for hopeless treatments. He remembered that our father, with a different form of cancer, opted for palliative treatment rather than aggressive chemotherapy that was doomed to failure. My brother made the same decision. With nowhere else to go, he remained on the oncology floor at Richland Hospital, despite the ever-increasing cost of his daily care. He belonged in a nursing home, but, like outpatient treatment centers, nursing homes don’t take patients without healthcare coverage. Finally, at the end of October, I managed to arrange his transfer to a nursing home. In addition to being far less expensive, it was also a much more pleasant place to live out the final weeks of life. On December 3, 2010, he died at the age of 54. I don’t know that earlier diagnosis and treatment would have saved my brother. We don’t get the chance to live out different scenarios to see how they would end. However, I know that with insurance he would have had a chance. Without it, he had none. Others may not care about that. It may be easy for some to write off the life of someone who died very sick and uninsured, but the reality is, we, as a society, are already paying to take care of these people, we are just doing it in an incredibly inefficient way. Hospitals that provide care for patients without healthcare coverage cannot bear the cost alone, so these expense of providing lifesaving treatment for these patients is passed along to every other patient who receives care. For most, this means the cost is passed on to insurance companies, which in turn increase premiums for all subscribers. In the end, it costs us all to manage healthcare in this way. There is no upside to this story, but there is a better way to provide healthcare for people like my brother. 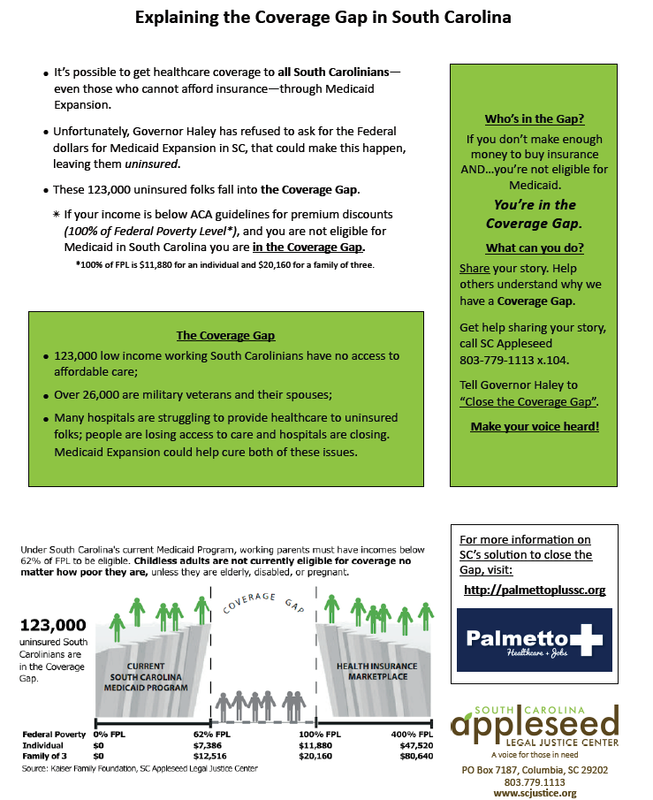 We must close the coverage gap, so all South Carolinians can have access to affordable healthcare coverage, so they can simply visit the doctor when they have a sore throat, before it becomes inoperable cancer—or at least early enough for less costly and more effective treatments to still be a viable option. In Loving Memory of George Shuler July 21, 1956 – December 3, 2010. 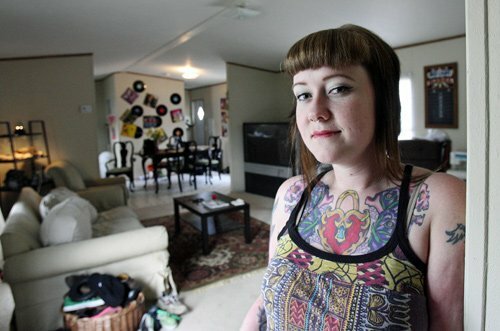 In South Carolina, 123,000 uninsured residents fall into the health insurance coverage gap. These South Carolinians fall below 100 % of the federal poverty level, and are ineligible for Medicaid and help to buy insurance through the marketplace. That’s a yearly income of $20,160 for a family of three and $11,880 for an individual. SC Appleseed, along with other nonprofits, statewide associations, business leaders, a chamber of commerce, and individuals concerned about the future of SC’s healthcare formed the “Close The Gap SC” coalition. We support the Palmetto Plus proposal that would extend health care coverage to more than 123,000 South Carolinians through the use of existing federal funds our state has failed to use. To find out how you can help our efforts and share your story, please sign up for email alerts on PalmettoPlusSC.org! Was the ACA successful for you? We want to know! Need Help Filling Your Prescriptions or Finding a Free or Low-cost Clinic? See if you're eligible for prescriptions assistance and search for clinics in your area. Have questions? Send us a private message using the form below. Is the issue of health care pushing your buttons?